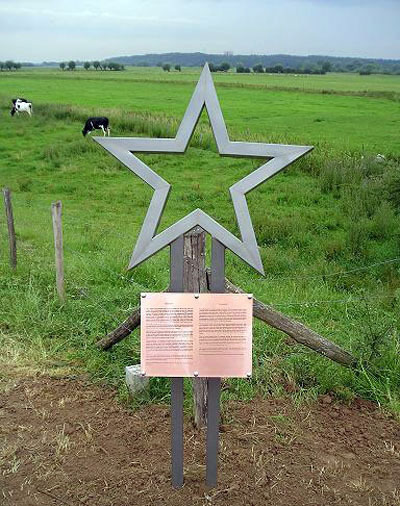 Around half past five on the morning of October 5, 1944, American soldiers of Easy Company of the 506th Parachute Infantry Regiment and soldiers of two German companies crossed each other’s paths at this very spot. The German soldiers had crossed the Lower-Rhine river probably to reinforce an attack in the vicinity of Opheusden. A patrol of five Americans were exploring the area when they were caught in the line of fire of the enemy. Although one soldier was seriously wounded, they managed to withdraw to the command post where they reported the incident. A second patrol set off immediately, to fight back the enemy. The second patrol snuck up on the machine gun which had attacked the first patrol, fired some successful rounds and then returned to their fallback position. Firing from both sides broke loose. Later, the American commander discovered that the enemy was hiding behind a raised dike while his men were in a shallow ditch without any possibility of safe retreat. The best and only option was to attack. At dawn the orders were given to fix bayonets and to wait for the signal to charge. The attack started when 35 American soldiers ran toward the dike, not realizing that some 150 Germans were waiting behind the embankment. The German company, however, was completely taken by surprise and panicked even though they were attacked by only a relatively small group of Americans. Meanwhile, a second German company crossed the dike toward this unexpected confrontation. Despite this reinforcement, the few Americans managed to hold out. The Americans won the battle in spite of bitter German resistance. Fifty German soldiers and one American soldier were killed. The American soldier was hit by a shell fragment that pierced his heart. This soldier was William Heiter Dukeman Jr (2-09-1921 - 5-10-1944). May this symbol remind us of all the soldiers who fought in this battle. On 13 January 2011, the memorial was hit by an unknown car. 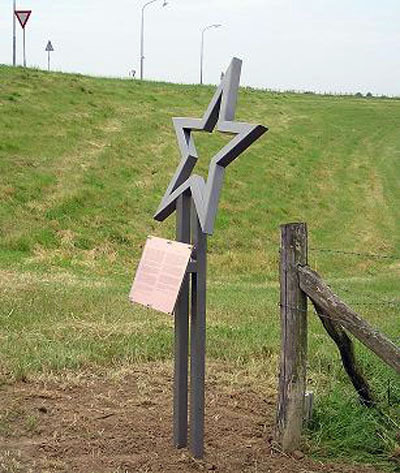 The memorial is replaced by a new memorial in August 2011. You can see the old memorial on picture 4 and 5. The battle of the 'Crossroads' is part of the tv series Band of Brothers. BROWN, BILL, Fighting Fox Company, Casemate, 2014.